Kaleidoscope sunsets from your private rooftop observation deck! Spacious fully furnished 2 bed 2 bath townhome located just steps from the White Sandy Beaches in Redington Shores! No association fees or rental restrictions! Living level starts on the 2nd floor with a large living room and balcony, dining area with table for 8, kitchen including washer/dryer and a full bath. Intracoastal views from the living room, and Gulf views from living room and kitchen. Both bedrooms are on the 3rd level and separated by a shared bath with tiled shower. Both bedrooms have a view of the Gulf and the master has Intracoastal views as well and features a sitting area and a covered deck with a spiral staircase up the 4th level open deck. From the 4th level, the views are endless in all directions. Finishes include granite countertops in both baths and kitchen, low maintenance ceramic tile flooring throughout and multiple closets for plenty of storage. Paver driveway with private 2-car tandem garage and foyer entry. Over 1,500 sq ft of living space plus garage for a total of 2,348 sq ft of Salt Life just waiting for a new owner maybe its you! 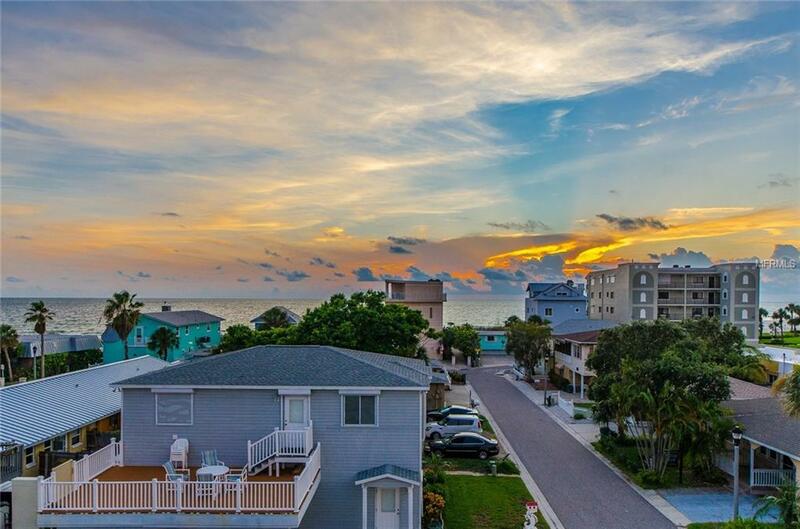 Schedule an appointment today to see this home at Redington Shores located near beach restaurants, pubs and retail; 20 minutes east to downtown St. Pete or north to Clearwater Beach, 40 minutes to TIA.